A little more than thirty years ago Peter and I travelled to southern Ontario to paint some historical murals one summer. During our visit we took the time to visit the spectacular Niagara Falls. I remember standing in a very large crowd at the top of the falls, slowly making our way towards the viewpoint railing. We were second in line from the front when a young boy approached the railing, took a very brief glimpse at the powerful falls and then turned to his dad and asked ‘Now can we go on the ferris wheel and have some fun?’ It made me laugh for the highlight of our day was the incredible waterfall before us. 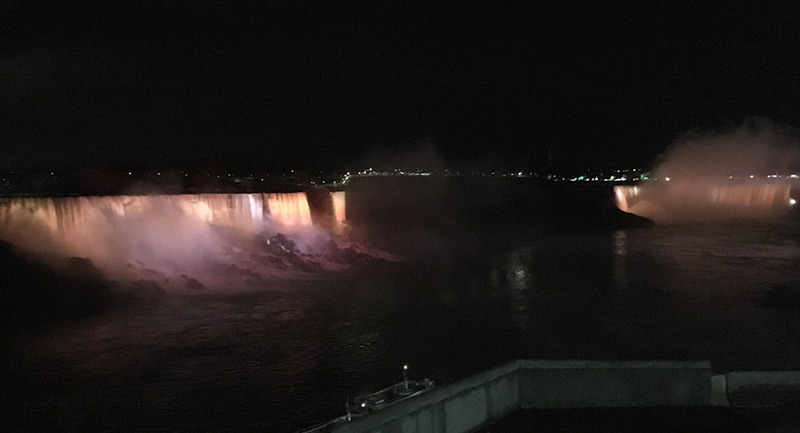 Tonight, I am again visiting Niagara Falls. As I walked from my hotel to get some supper this evening I could hear the roar of the waterfall in the distance. I decided to walk to the viewpoint first and get a good look at the brightly lit falls. The crowds were much thinner this trip as it is definitely the offseason and the evening was brisk. I didn’t have to wait my turn to approach the viewpoint rail. The falls were indeed still as incredible as I remembered. I enjoyed the view for a time and then like the little boy of so long ago, turned back towards the tourist attractions. I needed to focus on them for in the next days I’ll be in meetings as we consider a project there.